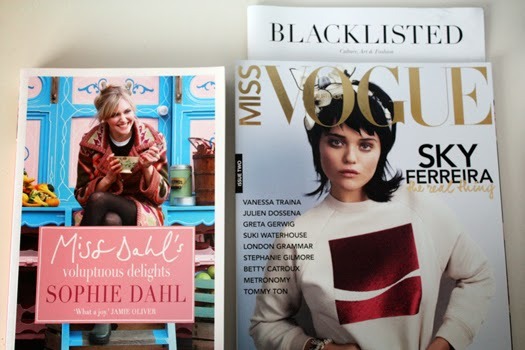 Miss Dahl's Voluptous Delights, a gift from Britney-I'm a bit of a Sophie Dahl fan, and I promise it's not entirely to do with her first name. I used to love reading the columns she'd write for British Vogue so I was excited to receive this cookbook from Britney. In it you'll find recipes as well as personal stories from Sophie coinciding with each season. It's a beautifully photographed and presented cookbook and I've been getting a lot of use out of it. Miss Vogue, Issue 2-The second volume of Miss Vogue Australia was released a month or so ago so I'm not sure if you can still find it at the shops now. I haven't really read this issue properly yet but there were lots of fantastic interviews and articles in this issue. There was also less iPad-exclusive content in this issue as well which is great if you're like me and don't own an iPad. 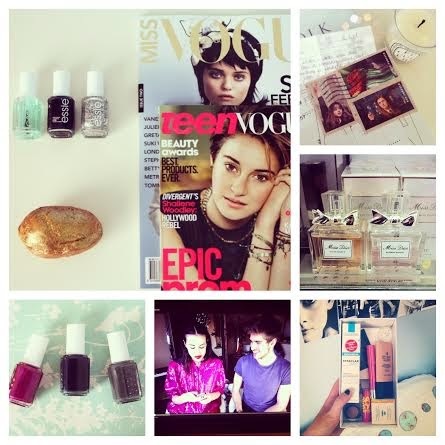 The Week in Instagrams @nanawintour: *The mail delivery to outdo all mail deliveries. I don't think my postman has ever seen me look so gleeful. There'll be a Sephora themed post up early next month. *Stepping out of my literal comfort zone with some Zara-inspired heels-from Kmart of all places. *Playing around with some Autumnal makeup colours. *Hannah and I had a girly sleepover on Friday night and we had one epic lolly table. There may have been sugar hangovers the next day but it was all worth it. *What I got up to on Monday. *The Easter Bunny came to visit! 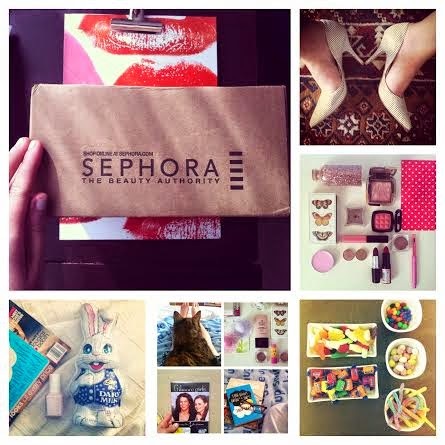 Must-Watch of the Week: Alix's Sephora Haul-for obvious reasons. I also liked Isabella's #lovemyselfie video encouraging people to upload selfies and share one thing they love about themselves. Let's all jump on that bandwagon over on Instagram this weekend. Don't forget to use the hashtag! Product(s) of the Week: These products aren't really products of the week, they're more products of the month. The April favourites lineup was getting a bit full though so I'm featuring them here. First up we have Thickening Dryspun Finish from Bumble & Bumble. This light spray creates texture and makes your hair look fuller. You aren't left with hair that feels crispy or weighed down by product. Revlon's Colorburst Matte and Lacquer balms have been the talk of the town this month. I have the lacquer balm in Coquette and I love it. It's a stunning pink shade that's not too neutral or too Barbie-like. Considering this has the glossier finish its lasting power isn't half bad. Must-Read of the Week: If you're after some Autumn nail colour inspiration then you can't go past Hannah's nail polish guide. Be warned; You'll have a longer wishlist after reading! I've also been loving Hello October blog after Suzie made an appearance in one of Amelia's videos last week. Check out her Lily Collins video-the makeup is stunning. Added to the Wishlist: Nothing beauty this week! I am still on the hunt for the perfect navy & white breton tee as well as some more flats/loafers. Hopefully there'll be some luck in the fashion department tomorrow. *Have a fantastic weekend everyone. It's Anzac Day today in Australia and New Zealand. A day of remembrance-I'll be thinking of my grandfather who fought in WW2. I seem to have a lot of birthday lunches/parties on this weekend but in between that I'll just be chilling and/or doing assignments. My life is so thrilling right now *ahem*. I've been a member of Mecca's Beauty Loop for a couple of years now and it was after a purchase of one of the Hourglass blushes recently that I came away with this box as well. Beauty Loop is Mecca's alternative to the Sephora Beauty Insider service or Space NK's N.dulge rewards. It works similarly to these but it isn't identical. 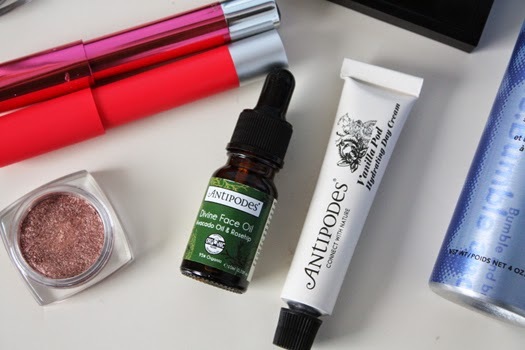 Some of the perks you'll get as a Beauty Loop member include free product samples, the opportunity to preview+buy products before they officially launch and receive Beauty Loop boxes like the ones pictured above. I do love a good sample box but they can be very hit and miss. 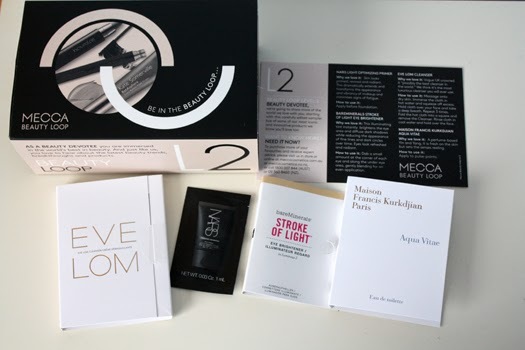 I had high hopes for Mecca's box though and decided to do mini reviews of what I tried for you. Note: The sample sizes were small so these reviews aren't meant to be in depth. Think of them as my first impressions, and verdicts on whether I'd go out and buy the products. Bare Minerals Stroke Of Light Eye Brightener-This is what I'd imagine a more luxe version of the Rimmel Wake Me Up concealer to be like. It's lightweight and is easy to blend. I'm not sure whether I received Shade 1 or 2 in my box but it definitely did have a brightening effect. It didn't crease on me either which is a bonus. Purchase? Probably, I'm just waiting for my Origins Plantscription concealer to run out first. Eve Lom Cleanser-This sample packet notes that Vogue once declared this the best cleanser in the world. Bold claims but it certainly delivered. One thing I will get out of the way now is I really didn't like the scent. It's not exactly overpowering but it is quite herbal which won't be for everyone. It has quite a balmy texture and it gets rid of all your makeup. My skin felt so clean after using this and the next day it was incredibly soft. Purchase? If you can get past the scent of this cleanser you'll probably really enjoy it. I can understand why Vogue and Lisa Eldridge are fans. Since trying this I've found out this cleanser contains mineral oil, which is an ingredient I tend to steer clear of so I'm not sure I'd buy this. It is also incredibly expensive *sad face*. Before I started blogging I used to love reading fashion blogs, in particular Tavi's and Phoebe's. I still do actually. They're a nice refresher and a break from words like 'pigmentation', 'formula' and other beauty phrases. 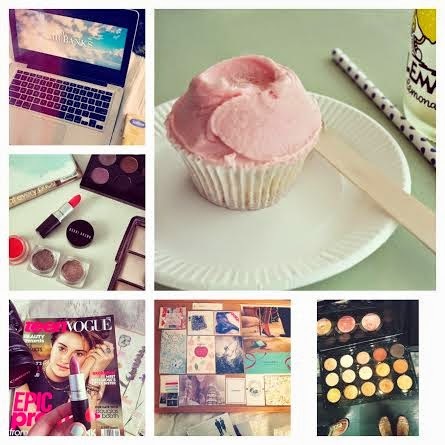 One of my current favourite fashion blogs is Shop Style Conquer, written by Tara and Ellen. As well as sharing their covetable outfits, they also post about beauty, nails and the happenings in their lives. Go check their blog out if you haven't already because it is awesome. A few months back I sent Tara and Ellen these questionnaires to fill in so you could learn a bit more about them. There's even some cute drawings to look at. Sorry the scans are a bit shabby but if you click them you'll be able to read them better. Aside from talking about skincare more on NW I wanted to also feature+try to include a wider variety of drugstore/budget-friendly beauty items on the blog this year. 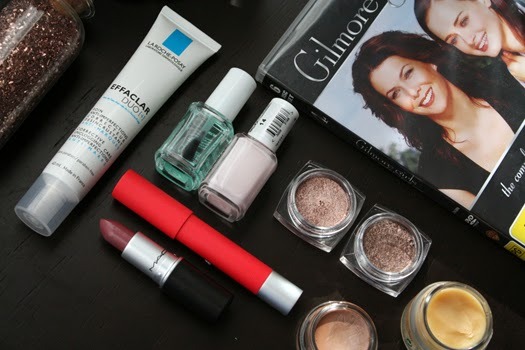 I think drugstore brands have come a long way in the last ten or so years and many of them are bringing out products that perform just as well as their higher end counterparts. They just have a not so hefty price tag, and sometimes less luxurious packaging attached. As we all know, what's on the inside counts. That was certainly the case when it came to my little Drugstore.com hauling. Now you may be wondering how I shopped with Drugstore.com, given I'm not based in America. I actually used YouShop, a service run by nzpost. It means you can order from American sites like Sephora or British sites like Boots and enter your YouShop address at checkout to get items we otherwise wouldn't be able to. They charge a fee of $12.50 for international postage and then $4.75 per 500 grams. In short, the more you order and the heavier it is, the more it'll cost. Note that if they can, YouShop will repackage your order for you to reduce the cost of postage. Once you've paid for your items they'll be shipped to New Zealand. This YouShop order arrived within 5-6 working days which is pretty good and cost $22 to ship here. I recommend spending the minimum amount to qualify for free shipping on the British or American sites to avoid incurring shipping costs from them on top of the YouShop fees. It will save you money but it is entirely up to you. Now on with the haul..
L'Oreal Colour Infallible Eyeshadows-These are two shades I've seen doing the rounds on a few beauty blogs, and they're something I have wanted to try for a long time. I picked up the shades Amber Rush and Bronzed Taupe. Their formula reminds me of Mac's Veluxe Pearl eyeshadows, shimmery but not overly glittery. They are also super easy to blend. If you're in America or have a friend going over on holiday then you should get these shades. EOS Spring Lip Balms-This may seem a bit of a random purchase (it was). I wanted to bring my order total up so that I could get free shipping from Drugstore.com. This is the limited edition set EOS have bought out for Spring. It contains a Passionfruit lip balm and Strawberry Sorbet, the latter which has been passed on to Hannah. 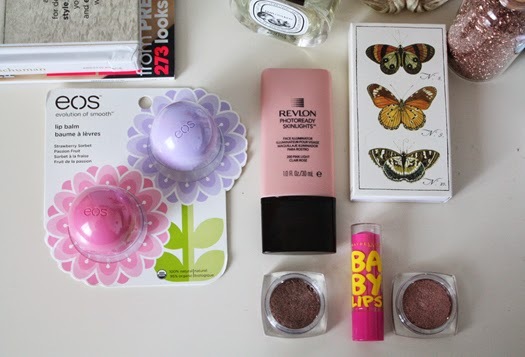 I really like the EOS lip balms. They're hydrating, deliciously scented and won't dry your lips out. 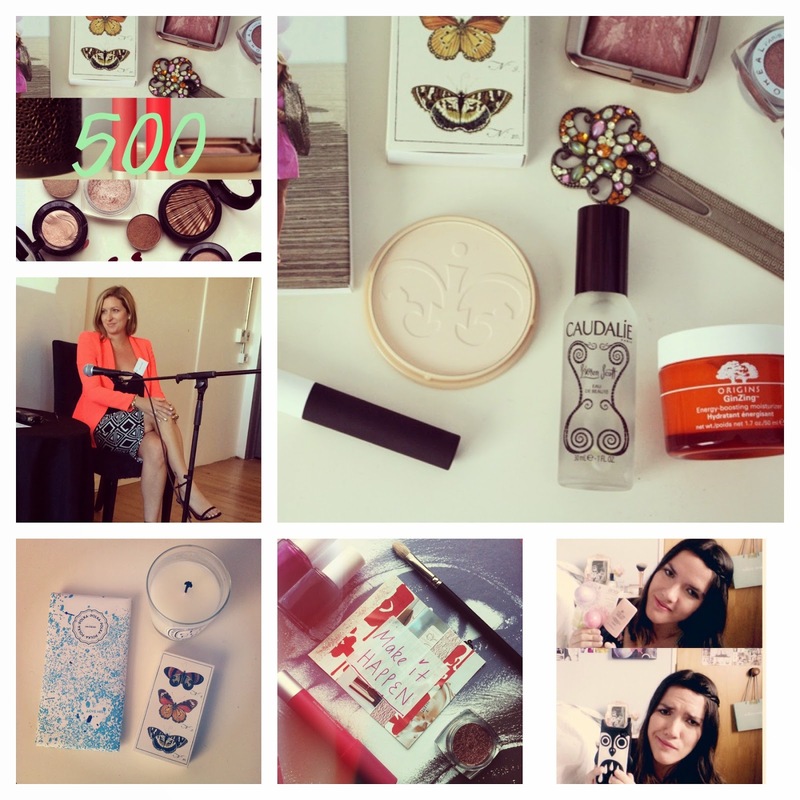 The Week in Instagrams @nanawintour: *Saving Mr Banks watching. Note the mandatory tissues. *The Beauty Scenario Tag. *A Back 2 Mac lipstick in the shade Syrup. *A Fall pinboard update. *Bluebells Cakery deliciousness on Sunday with Mandy. *Looking at the Warm palette in Mac the other day. The colours in this palette are so pretty! Must-Watch of the Week: If you saw my Beauty Scenario Tag post you may have noticed I tagged Tara and Ellen from Shop Style Conquer. They filmed this video in response and you should go watch it, just because. It's very entertaining. Oh and go hit the subscribe button while you're there. I know they'd appreciate it. Product(s) of the Week: NYX Blush in Taupe-If your complexion errs more on the paler side of things then you'll like this blush from NYX. I don't use it as a blush as such, but it is great for subtly sculpting your face, adding shadows in the right places, creating the illusion of cheekbones-whatever you want to call it. It's super cheap too which gets it bonus points. 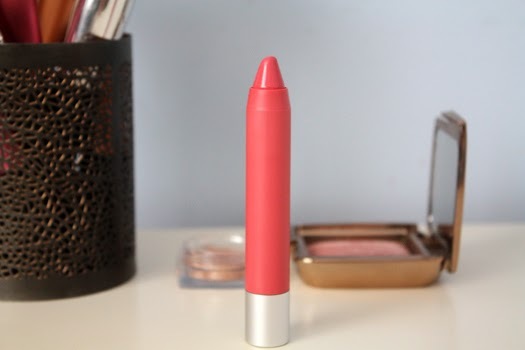 Another purse-friendly find this week is the Nivea Lip Butter in Raspberry Rosé. Firstly it smells delicious, like cake frosting. Secondly, these are so moisturising. This new one doesn't seem to have as thick a texture as some of the other lip butters from Nivea which I don't mind. Throw one in your trolley when you're supermarket shopping. Today I thought I'd do a round-up of all my social media links. Whether you're new to Nana Wintour or visit frequently, this guide will let you know where else you can find me online. I'm in the process of making a YouTube channel too so once that's live I'll update this list+tweet out a link. Facebook-All my blog post updates go live here first which then link on over to Twitter. 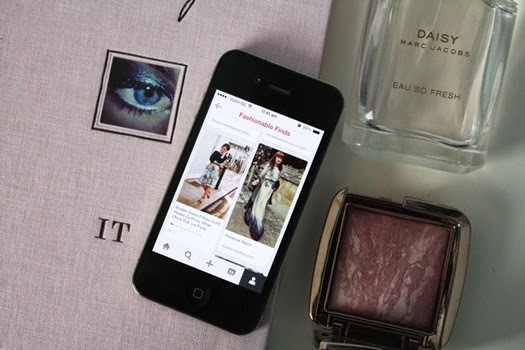 I tend to post once a day on my page at the moment so if you're not hearing about a new post, there's bound to be something else fashion or beauty related appearing on there. Bloggers Club-nzgirl have recently established a sister site for bloggers which essentially acts as a platform for other brands+people to find us and see our work. Here you'll find posts I have written for nzgirl along with links to some of my social media profiles. I often write about topics that I don't cover on Nana Wintour (e.g. recipes) so give me a follow, if you want to. Pinterest-I love pinboards and creating visual collages so it's hardly surprising that I love Pinterest as well. You'll find a bit of everything on my boards; recipes, fashion, more beauty, wise words and interior inspiration just to name a few. The Beauty Scenario tag was created by Lily Pebbles and it's one I have always wanted to do but never got around to until now. Typically this would be a video but I didn't have time to film this. I also currently look like a tired mess so I didn't think you would want to see that. Anyway, here's how I'd solve the following beauty scenarios..
You have to get rid of all your foundations and you can only keep one high end and one drugstore. Which do you keep? I don't actually own many foundations and bases mainly because I struggle to find colours that don't make me look overly orange. The ones I do own are not my favourites either. I'd probably get rid of them and replace them with something else, like the new Chanel Perfection Lumiere-Velvet foundation or Jouer's Matte Moisture Tint. You go for an interview and the lady interviewing you has lipstick on her teeth. Do you approach the subject or ignore it completely? Ignore it completely, because then it might just make the rest of the interview awkward. You're not feeling your best and need a pick me up. 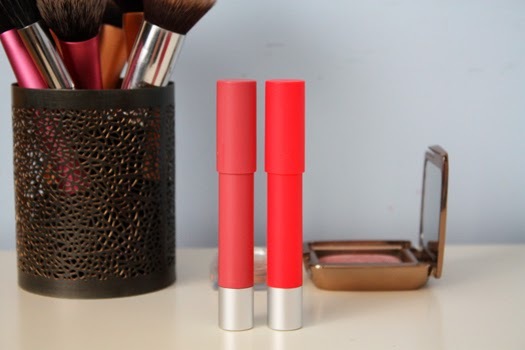 Which lipstick do you put on to make yourself feel beautiful? Impassioned by Mac. It's a vibrant, raspberry pink and it always makes me feel happy and beautiful when I'm wearing it. Magic lipstick perhaps? The Week in Instagrams @nanawintour: *More Friday fun. That Lush bath melt was so luxurious, an Easter treat without the guilt-factor. *Harry Potter stamps on a surprise letter from my friend Hannah. *Sometimes I go into shops just to spritz fragrances I love but don't own. This week's candidate was Miss Dior. *Recycling a box that housed PR samples. It now holds the products I am trialling this month. It's early days but I am loving a fair bit of what you can see in there. *Miranda Sings videos never fail to make a below average day better. *Essie Fall Fingertips. Currently After School Boy Blazer is my favourite from the new colour range. Must-Watch of the Week: The 7 Seconds Challenge With Miranda Sings. Zoe and Miranda collaborated and the internet exploded, well at least it did in my corner. Just go watch it, it'll make you laugh. On a more serious note, Anna shared her latest 5 Minute Face, inspiration for the mornings you're in a rush. It's also proof that you don't need the standard 20+ minutes to look half decent. Product of the Week: L'Oreal Infallible Eyeshadows in Amber Rush and Bronzed Taupe. These are definitely some of the best eyeshadows on the market at a more budget-friendly price point. They're similar to pressed pigments in terms of the foiled finish when you apply them damp but I prefer them just as they are. Both these colours are beautiful, they're easy to blend and with eyeshadow primer underneath they're pretty longwearing as well. Side note-You cannot get these shades outside America but you can buy them online. It was a very exciting day when the Essie Fall Collection* made its way to me. Each of these colours are inspired by various materials in fashion-flannels, knits, lace and twill. There is bound to be a shade that suits you and your outfit's needs. All these new colours come with Essie's new formula and wide brush which take all the fuss out of nail painting, and give you longer lasting colour. 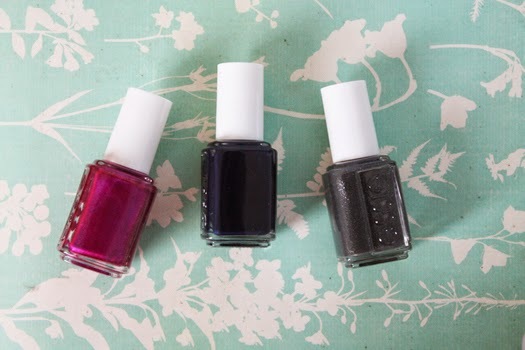 A new quartet of colours have been released for Fall but this trio are taking my fancy. First up we have The Lace Is On-a vibrant, metallic fuschia that is sure to make a statement on the nails. Pair it with an LBD and some statement rings for extra oomph. After School Boy Blazer-was a shade I talked myself out of buying at Christmas as it didn't seem seasonally appropriate, so I was excited to see it made its way to our shores. A deep navy blue that looks almost black in certain lights. I've layered this silver over the top and it looks stunning. This may well be my new favourite Wintry nail colour. Finally we have Cashmere Bathrobe-How adorable is that name? A grey with subtle flecks of glitter and the more neutral offering of the three. I can see this working well as an accent nail alongside After School Boy Blazer. Good things come in threes, and I'll certainly be getting a lot of use out of these colours this Winter, although there's still a vampy red hole in my nail polish collection, Sole Mate may just fill it..
Essie's Fall Collection is available now from select Farmers and pharmacies nationwide for a limited time only. *Will you be adding any of these shades to your collection? You all know by now that Mac is popular around these parts, especially their eyeshadows and lipsticks. 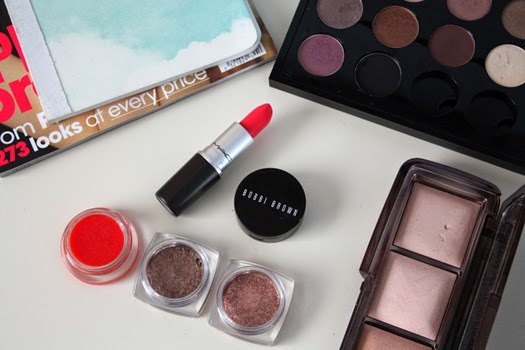 Today I thought I'd shed some light on some more eyeshadows and a few of their other fan favourites including the eyeshadow brush you all need, an eyeshadow for lazy days and more. 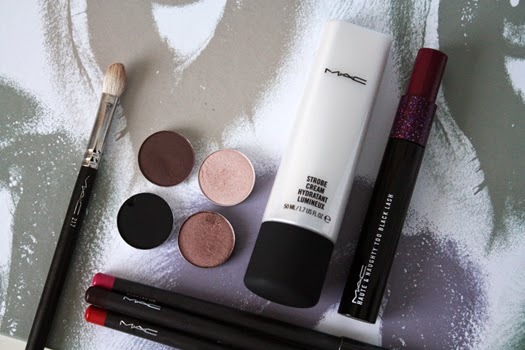 Read on..
#217 Blending Brush-This would have to be one of Mac's bestselling products, I'm sure many of you probably own one or two of them yourselves. The 217 takes all of the work out of applying eyeshadow. It deposits colour across the lid and its rounded edge means you can buff the product out to blend it in. As you can probably tell mine is well loved, it must be nearly time to pick up another one. Sable Eyeshadow-I bought this colour last month when I purchased my Mac palette case and have been alternating between it and Naked Lunch (below) since. Sable is described as a gold-plum with bronze pearl. On my lids it's somewhere between a bronze and a taupe with subtle shimmer. I like to pair this with something warmer in the crease like this bronzer in Laguna. It's a stunner. If you've got brown or green eyes you'll love this shade. Carbon Eyeshadow*-Carbon is one of those shades that looks dead scary in the pan, to me at least. It's not neutral, it's not shimmery. While I definitely won't be sporting this colour all over my eyelids any time soon it makes a great eyeliner shade when paired with an angled or flat eyeshadow brush. I never like my eyeliner to look neat so I like to smudge it out for a more lived-in look. If you're creating a smoky eye, Carbon works well as a crease colour for that. The Week in Instagrams @nanawintour: *Wednesday marked 500 posts on Nana Wintour. If you're reading my blog for the first time, or visit regularly-thank you! It means the world to me. *The Repurchases. *Getting my pose on. As you can see I wasn't taking it very seriously. *April's mantra: "Make it happen". *Friday fancies. Polka Chocolate is really good. Pick some up if you're in Auckland. *Jenene sharing her wisdom with us at Generator on Monday. Must-Watch of the Week: In lieu of a video this week, if you're in the beauty community you may know Becky from Talk Becky Talk has had an awful week. Go send her some love on Twitter or YouTube instead of watching a video. On that note, take some time today or this weekend to tell (or show) someone how much they mean to you. Life really is too short to not share meaningful things with the people we love. Product(s) of the Week: La Roche Posay Effaclar Duo [+] and Bare Minerals Stroke of Light Eye Brightener. I've been using the Effaclar Duo for the past couple of weeks and really notice a difference on nights where I forget to use it. If you have acne scarring or nasty blemishes this will take care of those. It also unclogs pores and controls shine, the latter I am really noticing a difference with. I've been using a sample of the Eye Brightener from a Beauty Loop box this week as well and love it. It is very lightweight but creamy so it is easy to blend. It doesn't crease or settle into fine lines either. I'm impressed! Must-Read of the Week: This is less of a read and more a visual feast. So, feast your eyes on this outfit over on Olivia's blog. Beautiful setting and even more beautiful clothes. This gives me mega Alexa Chung and Beatles vibes. I love it! Added to the Wishlist: Lonely Lingerie. I know this'll seem like a frivolous inclusion but there is just something special about gorgeous lingerie and Lonely lingerie is the best. I'm loving the Cyd set in navy but they're all lovely really.